Celebrate your brand by adding a company logo to new name tags. From a single color, engraved logo to full-color and UV graphics, each image will look great on either plastic or metal materials. We even hot-stamp logos with metallic foils. These tags are made for logos, so if you don't need one try a Classic Name Tag. PROOF APPROVAL: Production will begin as soon as we receive an approved proof and a properly formatted list for engraving. QUANTITY DISCOUNTS: The bigger your order, the better the discount. See individual order pages for more details. EASE OF ORDERING: Once you place your order, the information and custom layout are maintained to make reordering easier. FAST, FRIENDLY SERVICE: Our customer service representatives process each order quickly and stay in touch during the entire process in case you have questions. By adding your multi-color logo to these top-of-the-line name tags, you are sure to get the best bang for your buck. With low minimums and the best pricing around, you'll be happy you came to us with your color blends and shading needs. We guarantee to provide the best Full-Color Logo Name Tag you have ever had. Our best full-color option is premium UV printing. These plastic name tags with engraved text will highlight your logo in a way you didn't think possible. And, they are available in 29 colors. Prices range from $3.81 to $7.60 each. Quantity, size and options affect the price. Make your UV color logo stand out even better on our aluminum material. Print using color blends, shades and using unlimited colors, including white. Available in gold, silver or white metal. Prices range from $4.20 to $8.38 each. Sometimes a name tag just needs to have a full-color image. With an optional full bleed (printing to the edge), these tags are perfect for all logo and graphic needs. Prices range from $3.34 to $6.66 each. These high-quality, low-cost name tags feature a single color for your logo needs. Each name tag has a two-color profile with engraved logos and names, and every selection is sure to get the attention your brand deserves. Choose your size, color and get your brand out there shining above your competitors. Our plastic engraving is perfect for your single color logo and text. We guarantee your name tags will spark trust in your brand, and they are available in 29 color combinations. Prices range from $3.74 to $7.45 each. With so many shiny choices, these metal engraved name tags will make your logo brilliant. Choose from 18 fun colors and get your business outshining and surpassing your competition. Prices range from $3.90 to $7.77 each. Hot-stamping provides a beautiful metallic look to any monotone logo. From metallic silver or gold to matte white or black, your hot-stamped logo will look amazing next to each engraved name and title. And, on these two-ply plastic name tags, your branding is sure to grab your customer's attention. Prices range from $3.81 to $10.36 each. Purchase of metal die is required. Not every name tag needs a logo. Choose from metal or plastic name tags. Use one of our template designs or create a custom layout that is unique to you. Name Tag, Inc. carries a wide selection of name tags, name badges and badge holders. If you don't see what you want, give us a call and we'll help you find it. Large selection and Low prices! Name tag pricing is dependant on the product configuration. For comparison purposes, this page shows the prices for a 1x3 name tag with one line of engraving, a logo as described in the process below, and a standard fastener. Complete pricing tables are available on each order page. Laser engraved text and logo: Selected material color combination will determine the color of the engraved logo and text. SET-UP FEES: $25.00 (No set-up fee is charged on re-orders of the same layout). UV Color Logo: The logo will be UV printed, the text will be engraved. Digital Full Color: Printed text and logo. Bleeds and printed backgrounds may be possible. SET-UP FEES: $35.00 (No set-up fee is charged on re-orders of the same layout). The logo will be hot-stamped onto the plastic using metal stamps and foil, the text will be engraved. Maximum of three colors in the logo. Metallic foils are available. Logo colors are limited by availability of foils. 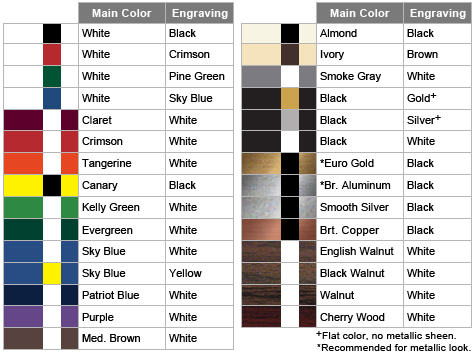 First order (includes required metal stamp(s)): $45.00 for one color, $75.00 for two colors, $100.00 for three colors. Reorders of the same layout: $5.00 for one color, $7.50 for two colors, $10.00 for three colors. Name tags with any of the following: Engraved logo, UV color logo, hot-stamped logo. Name tags with an engraved logo. Digitally printed name tags. White will not print using the digital printing process. Digital printing is translucent, polar white plastic is recommended. Hot-stamped logos are generally used for metallic colors only. If ordering a hot-stamped logo, the logo must meet certain requirements. It must be a one color logo or the logo must contain a metallic color option. If neither of these requirements is met, please order your name tag as a UV Color Logo. Availability of foil colors may change. If this happens and you reorder an existing layout that requires a discontinued color, we will attempt to find a close match, but there is no guarantee that this will be possible. Unlimited colors including gradients and color blends. UV Name Tags will have engraved text. Digitally Printed Name Tags will have printed text and logo. $35.00 set-up fee on first order only. Logo and text will be engraved creating a two color tag. Color will be determined by the material chosen. $25.00 set-up fee on first order only. Colors must be chosen from available foils; metallic foils are available. Purchase of a metal stamp for each color is required. two color logo: $75 (add $25 for additional colors). Set-up fee for reorders of the same layout: one-color logo: $5 (add $2.50 for each additional color).